The early 13th century seal of the City of London. On the right is Thomas á Becket and on the left St.Paul defending London. Upon the death of Stephen, the last of the Norman kings, the throne passed to Henry II, the first English monarch of the Plantagenet dynasty. By the end of his reign Henry had expanded his territories by inheritance, marriage or conquest. Directly or indirectly he controlled almost the whole of western France, England, Scotland, Wales and Ireland, the largest empire in Europe. In the late 12th century the legal clerk William FitzStephen wrote one of the earliest detailed descriptions of contemporary London. Since being re-established three hundred years earlier by King Alfred the Great the town had by the end of the Norman period become a thriving port city, watched over by the Tower of London, dominated by the vast St.Paul’s Cathedral and with the only bridge across the River Thames for miles. Yet it was still not the main city in the kingdom, or even the biggest, a situation that would gradually change in the following two hundred years. Two miles to the west of the walled city of London – what could be a dangerous journey by road – was the separate town of Westminster, built on an island created by two branches of the River Tyburn where they joined the Thames. It was the home of one of the most important royal palaces and a major abbey that was used for the coronations of English kings. Some of the greatest influences on medieval London were the many ecclesiastic institutions that permeated almost every aspect of life in the city. A multitude of religious bodies were collectively the biggest landlord and employer both inside and outside the city walls, retaining thousands of people as priests, monks, nuns, or as workmen to maintain the large number of churches, monasteries and schools. London contained more churches than any other city in Europe and there was almost no street without a parish church, monastery or some other religious building, with the daily cacophony of church bells being a feature of the medieval city. In the latter 12th century there were at least thirteen major churches and one hundred and twenty six lesser ones in and around what was still only a small town. There was an influx of various orders of monks from the Continent during the 13th century, each founding their own monastery. The original and principle church of London was St.Paul’s Cathedral. The structure that existed during the Middle Ages had been started in the late 11th century and was the largest cathedral in England, dwarfing all else in the city. At almost two hundred metres it was longer than that of today and its spire the tallest ever constructed in Europe. The Saxons built a new wooden bridge across the Thames in the 10th century, which was damaged in the great fire of 1136 but probably repaired enough that it could continue to be used. Between 1176 and 1209 a replacement was built slightly upstream, under the supervision of a parish priest, Peter of St.Mary Colechurch church, in the position that London Bridge occupied until the 19th century. New wharves continued to be constructed along the river and property-owners began moving their embankments further into the river in order to gain additional land. 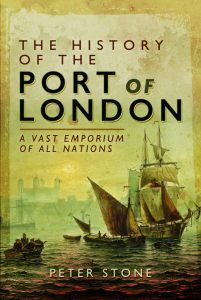 Ships grew in size and were too large to pass under London Bridge, so an increasing amount of loading and unloading took place at wharves and docks between the bridge and the Tower. Germanic merchants took over the trade routes of Northern Europe in the 12th century that had previously been plied by Scandinavians and they had a strong presence in London. Exotic goods were arriving from distant places but the biggest import was wine from the Rhine and France. The biggest export was wool, bound for the weaving towns of Flanders.